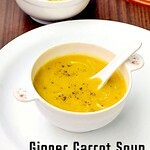 Ginger carrot soup recipe is a perfect, soothing, Indian vegetarian soup recipe for Winter season. I have never imagined a soup recipe beyond tomato soup and sweet corn soup so far. Other than this, I have tried Veg clear soup with wontons in a Chinese restaurant and tomato shorba in a North Indian restaurant. 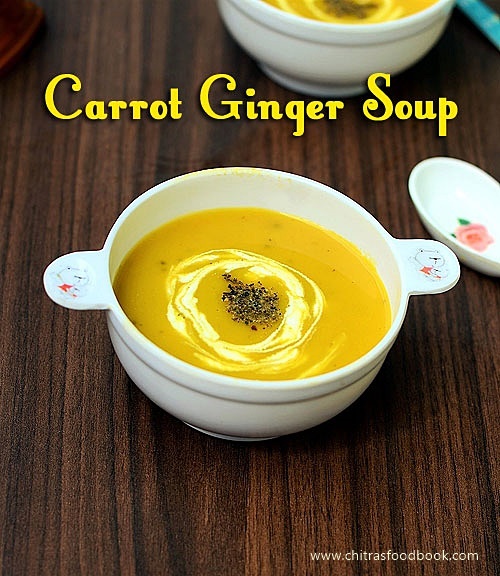 Last week when I was talking with my friend Shalini, she was suggesting me to try this healthy ginger carrot soup by sharing her recipe. This recipe is without coconut milk and milk. So Vegans can try this recipe adding olive oil instead of butter. Even weight watchers can have this soup as it is prepared with ginger. I have heard about this soup but I had no idea of how it tastes & looks. I thought this soup might be having a sweet taste because of carrot and I was hesitant to try it. On the same day, I got a mail from the editor of Daily thanthi newspaper asking me to share some interesting soup recipes for Monsoon. I tried this soup with a 50-50 mind set. But to my surprise, it came out extremely well. Sendhil & Raksha were full of praises😄. The smell of butter and spices with the mild ginger flavor were awesome. For Vegan version, replace butter with olive oil. Non-vegetarians can use chicken stock instead of vegetable stock. I happily clicked the picture of this soup and shared the recipe with the editor. It was published on last Sunday Chennai edition. I was waiting for Karthigai deepam celebrations get over to post this yummy & rich, creamy carrot ginger soup recipe in my blog. 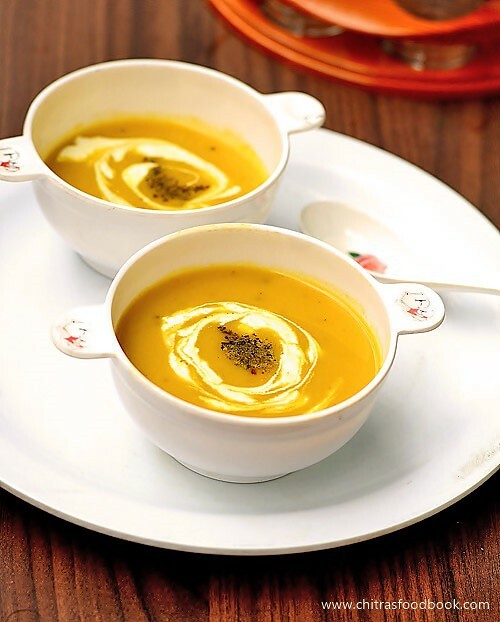 So here you see how to make this easy,creamy and healthy ginger carrot soup recipe ! It’s a perfect n soothing soup recipe for this rainy season. Check out my tomato soup & sweet corn soup recipes if interested ! Wash and chop the carrots into slices. Chop onions,ginger and garlic cloves. Heat a pressure cooker base adding 1 tbsp of butter (Use butter for best taste,Vegans can use olive oil).Saute bayleaf and cinnamon for a second.Add the chopped onions,ginger,garlic and carrot pieces.Saute for a minute. Lastly add 2 cups of water and required salt.Pressure cook in low flame for 2 whistles till carrots are done. Open the cooker after the steam is released.Drain the excess water in a bowl. Take out the bay leaf and cinnamon from the cooked mixture and add it to the drained water. Let the carrot mixture cool down.Grind them into a smooth paste adding reserved water.Strain the ground paste using a metal strainer.Use a spoon & mix well to strain it thoroughly.It will look like a paste while you strain.Add it to the reserved water and boil the soup for few minutes adding sugar,salt and pepper powder. Add little water if necessary. You can skip cinnamon if you don’t want more spices. This soup can be had directly without straining to get a creamier taste. Instead of carrot,u can use pumpkin. Fresh cream is completely optional.But don’t skip butter if you are not a vegan.It gives a great flavor to this soup. 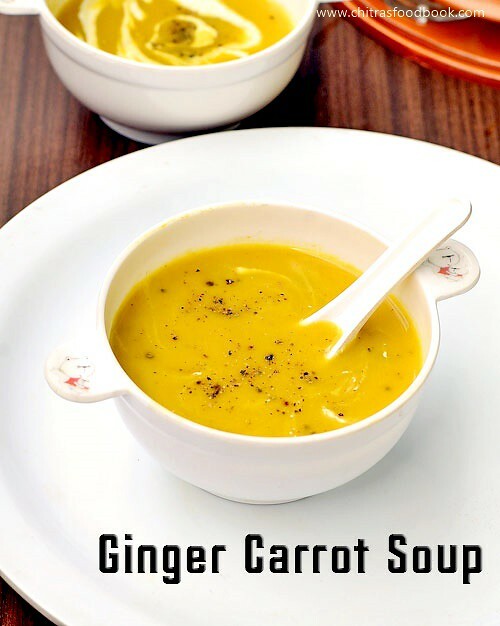 Try this easy,healthy Carrot Ginger Soup during this monsoon season.You will enjoy every sip of it !